Everybody I know downloads films and music illegally. The ‘Piracy is a crime’ campaign against movie piracy does not seem to work. March 31 HBO will broadcast the first episode of season three of Game of Thrones. I — with millions of others — will be able to see it within a day. For a phenomenon as widely spread as Piracy and non-legal media consumption it is strange it’s hardly ever addressed by scholars or in mass-media. Lawrence Liang describes in his article ‘Beyond Representation: The Figure of the Pirate’ how piracy is not publicly discussed (as for instance Open Acces). He asks: ‘[…]why can it not be accommodated within the terms of public-domain theorists?’ He gives several reasons for the resistance to piracy. Critics of media conglomerates will support anti-piracy for strategic reasons. The Open Acces movement wants to change the law, not break it. That the pirated goods ‘usually pertain to the domain of pleasure’ ads to adversity towards piracy. (If affordable medication and schoolbooks were distributed maybe this might be different.) The terms we use to talk about the public domain (citizenship, resistance and creativity) do not work very well to describe piracy or the people who commit it. As a result it is very poorly understood. Piracy of media products is often done by the inhabitants of countries where a functioning legal system and infrastructure are not available. These people often live in illegal conditions and do not operate in the public domain. It is questionable to expect them to follow the rules that come with it, such as obeying copyright. ‘The simplistic opposition between legality and illegality that divides pirates from others renders almost impossible any serious understanding or engagement with the phenomenon of piracy.’ How can we approach this phenomenon in a more meaningful way? I suggest to take a look at actual cases of piracy and analyze the social processes taking place. A good place to start is Lagos, Nigeria’s wealthiest city, but most of its 15 million inhabitants live off less than a dollar a day. Lagos is also giving shelter to a large number of pirates. How much they ‘pirate’ I don’t know, but the Nigerian Copyright Commission’s (NCC) Annual Report ( ) of 2012 says ‘3,621,787 units of assorted pirated copyright works; were seized last year. Despite the efforts of the NCC Lagosians will watch an illegal copy of ‘Chaos is coming’ (as the new episode of Game of Thrones is called) at the same time I do. Not all western productions are popular in Lagos. Often they’re not relevant for someone living in a slum, or it presents the image that everyone in Africa is either uncivilized or a warlord. Luckily is easy to find African films in Lagos, it accommodates the third largest film industry in the world: Nollywood. The widespread availability of illegal copies does not stop the distribution of low-budget Afrikan films (which off-course are also illegally spread). Over 200.000 people (and 1 million indirectly) are employed by Nollywood. Its films tell stories of the arrival in big cities and Afrika´s ´troubled journey to modernity.´ Nigerias filmindustry is so successful, other African countries complain about recolonization, ‘this time from within the continent’. The popularity of Nollywood across the African continent was made possible by the rapid distribution of its films by piracy, the establishment of the $800 million industry could not have taken place without it. Illegal distribution of films, the production of new films and the emancipation of postcolonial Africa seem to go hand in hand. 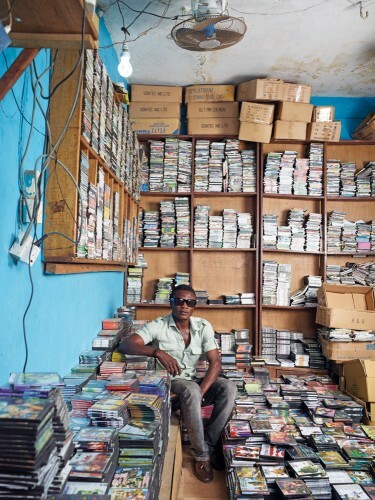 Emmanuel Eijke sells pirated CD’s and DVD’s from the Alaba International Market in Lagos. He started in 2003 and did so well the NCC offered him and other traders a deal. ‘The opportunity to sell their copied CDs legally, if they paid a 250,000 Nigerian naira (US$1,585) licensing fee. Now record labels come to shacks in Alaba to make distribution deals.’ Emanuel managed to become a legal businessman. How his deal with the NCC precisely works and how it complies with copyright, I don’t know. But it appears the NCC and the pirate salesmen of Lagos are finding ways to move existing pirate business structures into the official economy. Lagos and Nollywood help us to go beyond ‘the simplistic opposition between legality and illegality’ with which piracy is usually addressed. Nollywood is a major employer in Nigeria and produces films that are much different than the Hollywood mainstream films. It would not exist without piracy. It may not be impossible to incorporate pirate businesses into the official economy, such as Emmanuels shop was. In the discussion of piracy more attention must be given to what happens ‘on the ground’. By that the possible positive socio-political effects of piracy can be listed and realistic approaches of the problem can be developed. Zone, 2010, pp. 353-375: 357, 358. Zone, 2010, pp. 353-375: 361.